I made these for Tuesday night’s Pop Up Yoga NYC ‘s yoga and nutrition fundraiser to go with the chia theme and they were a hit! I love all things pumpkin and these were especially tasty – great texture, not too sweet, and packed with protein and fiber in every bite. Personally, I “tested” 4 as a snack and then had leftovers for breakfast (slathered in butter) the following morning. That’s right. Enjoy! Mix together all of the dry ingredients. Mix together all of the wet ingredients. Fold Wet ingredients into dry ingredients. Pour into greased muffin pan and bake at 350 degrees for 25-30 minutes. Yoga and chia were enjoyed by all at Tuesday’s fundraiser! On Tuesday, December 18 I will be teaming up with Pop Up Yoga NYC, Chia Star, Pushcart Coffee (Peter’s Field loc. ), SandyBaggers, and fellow health coach Steph Miller (www.hecticandhealthy.com) to provide an evening of yoga, wellness, and fundraising to support a local business in Staten Island – Not Just Bagels. I will lead a 40 minute calming vinyasa flow class which will be followed by an informal discussion and Q&A of our featured product – Chia Star. Steph and I will explain why we love chia and it’s amazing health benefits! Chia seeds have been dubbed “the running food”, “a miracle”, and “the ultimate super food” by athletes and advocates alike. Suggested donated items: Bottled water, blankets, Non-perishable food, Contractor garbage bags, Cleaning supplies (Sponges, Laundry soap, Dish soap, vinegar, hydrogen peroxide, Mold-X), Tyvek worksuits, Rubber work gloves, P100 particle respirator masks. Email me (maggieconverse@me.com) with questions or to RSVP. You can also RSVP by clicking here. Pincha mayurasana. Also known as, forearm stand or forearm balance. Demoing pincha mayurasana after a long run with running coach, Milly, at Sherpa in CT. Ever since I started doing triathlons in 2010, I’ve been fairly consistent in following my long runs (and rides) with a short 10-20 minute yoga practice. These practices typically involve basic poses that get into the psoas, hamstrings, quads, hips, IT band … the usual. We first tried L-pose (handstand modification) and then, pincha mayurasana. Milly is a rock star runner and a wonderful yogini because she was willing to jump right in and try the pose. AND, with attention to her form and a little assistance on my part, she got right into it. I wish I could remember exactly what Milly said once she got up, but I can assure you that a) it made me laugh out loud and b) it was a major “Ah-ha” moment. So, time willing, I will start doing some post-long run pincha – with Milly’s fearlessness in mind! 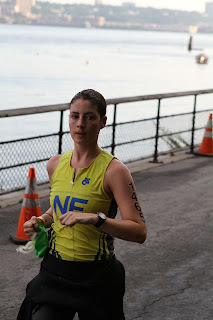 Post-swim NYC Tri, 2012 – thrilled to be out of the water! The numbers blew his mind, but his biggest concern was “What do you think about during the swim? ?” My immediate response: “Nothing … or at least that’s my goal.” And it’s absolutely true. While I have never done a 2.4 mile swim, my longest has been 1.2 miles for a half-Ironman, and for any open water swim I know myself and where my mind has the potential to go. If I let my mind wander I will a) start swimming off course, b) start psyching myself out, and, worst of all, c) panic. An open water swim can be a pretty frightening and intense experience. You look through your goggles and on occasion you can see what is beneath you, however it’s not rare to hardly be able to see your hand in front of you. Adding to that people swimming by you, pawing at your feet or, worse, kicking you in the face (knock on wood I’ve never suffered any injury from this). I will never forget my very first open water swim: Seaside Sprint, Bridgeport, CT 2010. As soon as I looked in the water and saw nothing but darkness, I panicked. I started feeling short of breath, my wetsuit immediately felt like it had shrunk 2 sizes. I tried floating on my back, keeping my head above water while doing breast-stroke, and distancing myself as much as possible from the other swimmers. Long story short, I finally made it to the half-way point and got myself together. The one thing that took me through that final 1/2 mile was monitoring my breath. That and starting to hear a cheering crowd. The swim portion of a triathlon can be a very lonely experience. You don’t have any crowds cheering for you and you can’t even make conversation with your fellow racers – one of the delights during the bike and run of a triathlon. When I did NYC Triathlon in 2010, my first olympic-distance race, I was racing for American Cancer Society in memory of my uncle who had passed away from cancer. The first moment I started hating the swim, I looked up at the sky while taking a breath in, and thought of him. I thought of the hardships he went through and how through all of that, he still had so much love for his family and so much humor. If he could get through that, I could certainly get through a swim in the Hudson River. This brought me back to the present moment and, most importantly, my breath. Breathing is obviously an important part of swimming and each time I jump in the water, the first few minutes are always a little scary. But once I settle into the rhythm of my breath, the fear and trepidation of what’s to come and all the “what if’s” of race day start to melt away. Sometimes I will count my breathing, or even hum along to the rhythm I am creating. Don’t get me wrong, following your breath while swimming in open water is HARD work – in the same way that sitting still and meditating for an hour is hard – but if it prevents me from the panic and helps propel me forward into race day, I’m all for it! How can you apply this to you? Well, think of any difficult or trying situation you have experienced or may experience in the future. This encompasses any situation where we find ourselves overwhelmed by stress or anxiety: starting a new job, having a difficult conversation with a loved one, or even spending time with certain relatives we may find hard to deal with around the holidays! Next time you find yourself in a tough spot, try taking a few deep breaths, and really LISTEN to your breath. Not to get all yogic on you but try to notice the quality of your breath – is it hard to breathe in deep? Does it feel a little restrained? Stay with it and see it you notice any difference in the way that you are able to approach the given situation. Oh, and let me know how you do.